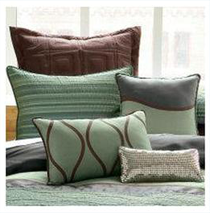 Throw pillows are an excellent way to freshen up a living room or bedroom or anywhere else you want to use them. By changing the throw pillows in a room you can completely and inexpensively change its look without having to paint the walls or purchase expensive (and often heavy) furniture, etc. You can completely change the style of a room with your placement and choice of throw pillows. We encourage you to experiment with different colors, shapes, sizes, textures, and patterns of throw pillows and find out exactly what you like (and what you don’t). If you are one of those many people who like to change the way the house looks every week, month, season or year then you’re going to love throw pillows (If you don’t already). Throw pillows are easily stored, and are pretty small so you can accumulate a collection of them and alternate looks throughout the year. Remember, there are thousands of different pillows so there is something for everybody, whether you like vibrant colors and wild patterns or if you like something more tranquil there are plenty of pillows out there for you. If you are considering changing the style or color scheme of a room, before you paint the walls and buy all new furniture, I suggest getting throw pillows in the color and style you want to convert to. This will give you a taste of how the colors and style you are considering will work together. This can prevent expensive decorating mistakes or assure you that your choices are correct. We’ll be here for you during all of your decorating (and redecorating efforts) with tons of tips to make finding the perfect look as fun and easy as possible!